Mailbox Forwarding offers a new, more convenient way to handle your mail. With our remote mailbox service, you can keep in contact with your paper mail wherever you are. We provide you with a mailing address which is accessible online. You can receive and view all your mail online: letters, documents, and packages, whether delivered by the USPS, FedEx, or UPS. We provide you with a unique street address box number where you can have all your mail sent. When a new piece of mail arrives, our staff automatically scan the front of the envelope. You can then manage your mail through an online control panel, and can request that we open and scan the contents, shred and recycle the item, or forward-ship it to your home or business address. Your online control panel makes it easy to manage the mail that comes to your virtual address. 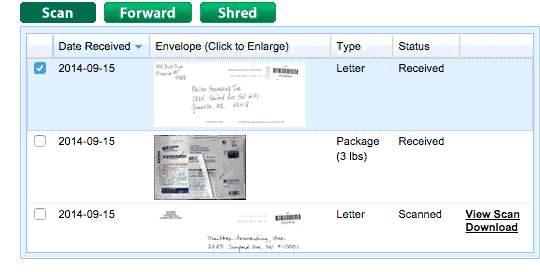 At the click of a button you can have your mail or packages forwarded globally, scanned so you can read the contents through your secure online account, or shredded and recycled. With pricing starting at only $14.95/mo and no setup fees or commitments, our service is a fraction of the cost of traditional mailbox services, virtual office addresses, and PO boxes that don't even provide mail scanning and online access. Also, our mail forwarding rates are some of the lowest in the mailbox rental industry. We enforce high security standards to ensure that your mail remains private and confidential. You can actively choose when you want a piece of mail scanned and when you want it forwarded to you unopened. Our staff are monitored during all mail handling activities, and your mail will never leave secure storage for longer than is necessary to scan it. © 2009 - 2018 Mailbox Forwarding. All rights reserved.